Laney (12 yrs.) is wearing a $12 raincoat. With a pair of rainboots we had and spray painted green. (that will easily wash off.) 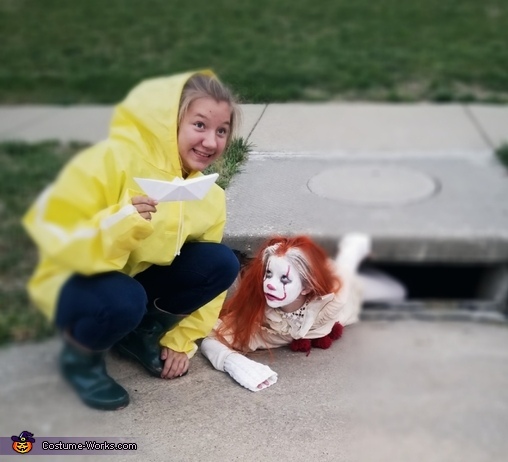 I made her an orgami SS GEORGIE boat from a piece of paper. Brenna (10 yrs.) is wearing ann off white shirt, trnnis shoes and leggings that we had. The over shirt and skirt I bought at a thrift store for $2.00. I made the yarn pom poms,neck piece and belt from scracth material. I bought the red balloons from party city for $5.00.. The leg and arm warmers, hair spray and make up I purchased from walmart for $20.00.